Why must you as a future bride do a lot of research in finding and doing your due diligence in having a true image maker that can create those incredible, unforgettable moments on your wedding day? Simple answer it is only ONE DAY. 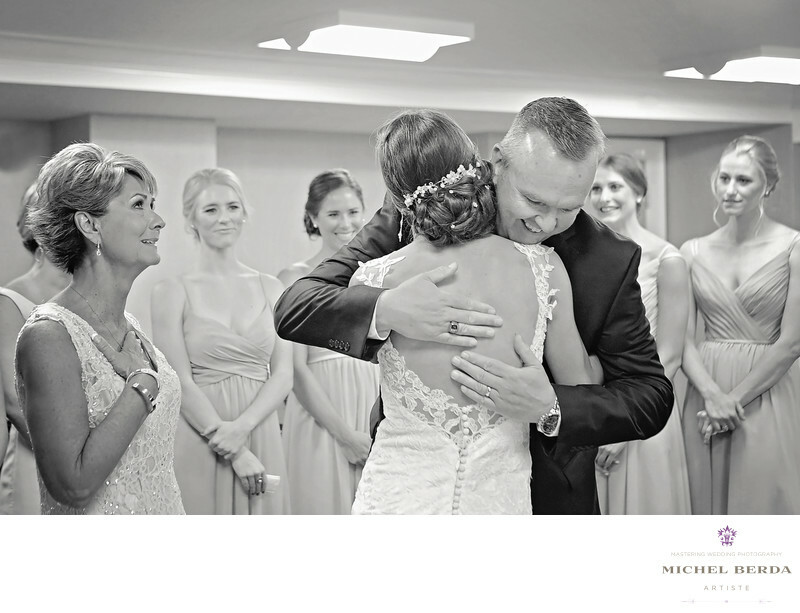 Here is an image of dad seeing his daughter for the first time in her wedding dress that I captured at Sonesta Resort Hilton Head Island Hotel. I am known among my peers and many coordinators for creating heartfelt wedding images. Here beaming at each other, the father & mother who wished for their daughter start of a new married life, sharing this special moment, always a softer side of dad, the father who turned around and away from the camera, because he was so emotional with tears in his eyes. Just seeing everyone reaction so joyful such a priceless moment, perfectly captured between her mom who likes everyone else is so emotional, with her husband, & the bridesmaids who can hardly keep it together, as dad sees his daughter in her wedding dress for the first time with very happy tears. A true storyteller as a want to make memories through his or her wedding images because after all the wedding photos are going to be the only tangible property left once the wedding is over. The key to all of this is to make very sure that your wedding photographer wants you the wedding clients, to always remember many unforgettable wedding images of this special and wonderful day. Keywords: father & daughter wedding images (3), Hilton head wedding photographer (6), hilton head wedding photographer sonesta resort (3), Michel Berda (1140), photographer (1125), Sonesta Resort Hilton Head Island Hotel (6), Wedding Photographer (1254), wedding photographer Sonesta Resort Hilton Head Island Hotel (6), wedding venue Sonesta Resort Hilton Head Island Hotel (6), weddings Sonesta Resort Hilton Head Island Hotel (6).